This post shows you how to create a LVM Snapshot volume in Linux. 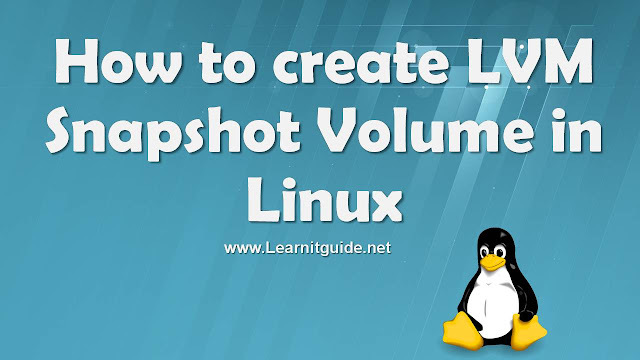 How to take a LVM Snapshot in Linux? Snapshot volume can be as large or a small as you like but it must be large enough to hold all the changes that are likely to happen to the original volume during the lifetime of the snapshot. We suggest you to have the same size of Source volume while creating a snapshot. For example, Lets say we have a volumegroup vg00, in which the source volume size is 4GB and we have free space of 4 GB Left in the volumegroup. So we can take snapshot of the source volume to the snapshot volume. If we dont have free space to create a snapshot volume, try to add a new disk to the existing volumegroup and create a snapshot volume. We will use the free space 4GB to create a snapshot volume in Linux. Where '-s' to take a snapshot of the volume specified at the last in the command and '-n' to specify the snapshot volume name. To verify the data, mount the snapshot volume snap_vol1 on some folder and ensure the data available or not. Your data will be available under /mnt, this can be used to restore the data from this snapshot volume anytime. And also you can remove the snapshot volume using lvremove command (lvremove /dev/vg00/snap_vol1) if you dont need this snapshot volume anymore.